The Matrimandir can be viewed as a large golden sphere surrounded by twelve petals which seem to be emerging out of the earth, symbolizing the birth of a new consciousness. The lovely green Matrimandir Gardens is divided into 12 individually named parks such as “Harmony”, “Bliss”, “Perfection” each with their variety of flowers, shrubs, and trees. 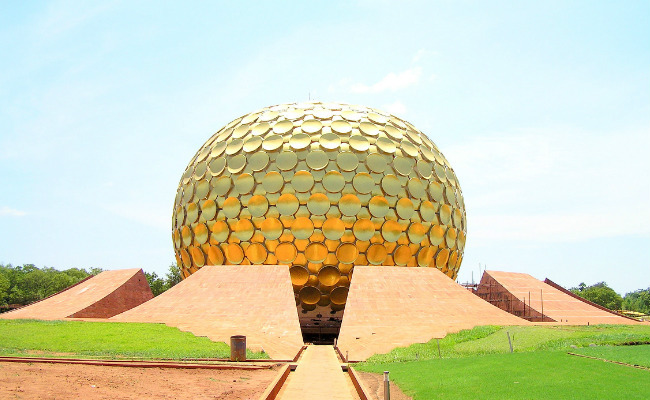 Situated at Auroville in Puducherry, Tamil Nadu. Visit https://www.auroville.org for more information if you are planning to visit this beautiful place for inner peace. 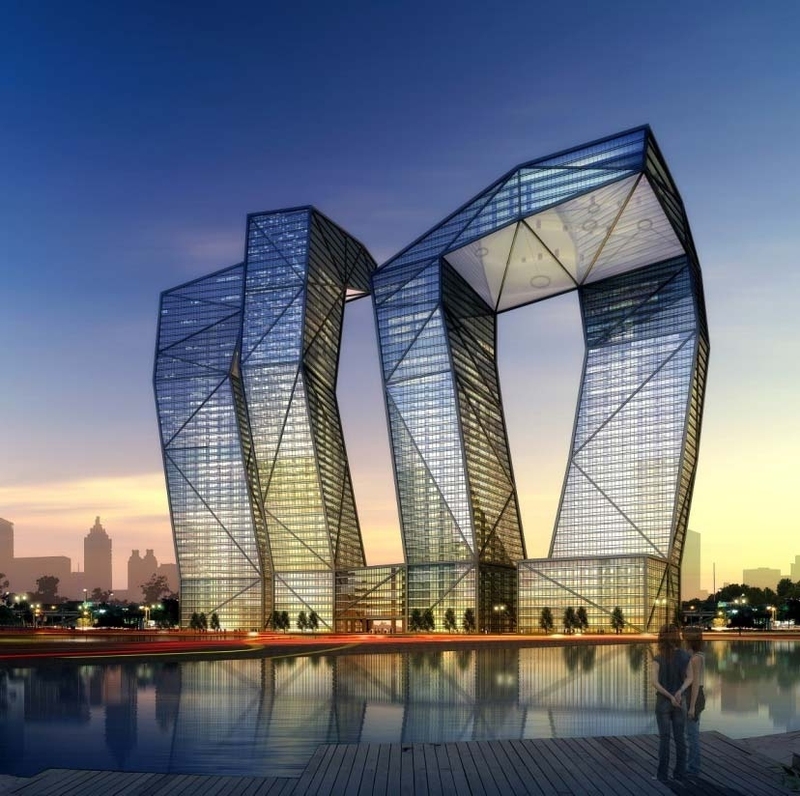 The Naga towers (Snake Towers) are 54-story towers being built in Gujarat International Finance Tech-City (GIFT). The GIFT city is being planned by East China Architectural Design and Research Institute (ECADI). The GIFT is situated at the bank of river Sabarmati. It will be the world’s largest and most modern financial hub. The entire project is completely sold out in advance due to its high demand as it is speculated that this project will provide employment to about 10 million people. This master-planned project will be completed by the year 2020. 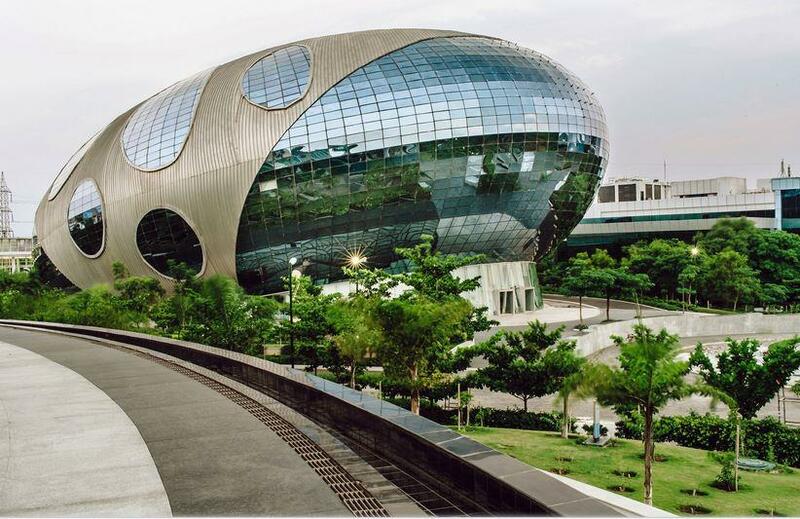 Designed like a spaceship, Infosys at Pune is a perfect example of modern architectural design. It has become one of the top picks for the tourists visiting Pune. This spaceship is software development building. Spread over 114 acres, the campus comprises office buildings, residential buildings, food courts, fitness training rooms among other facilities. This 14-floor building built in an area of 32000 sq.m. Cybertecture egg is self-sustainable and environment-friendly as well due to the use of solar photovoltaic panels and wind turbines on the roof. This egg-shaped architecture symbolizes the modern architecture. 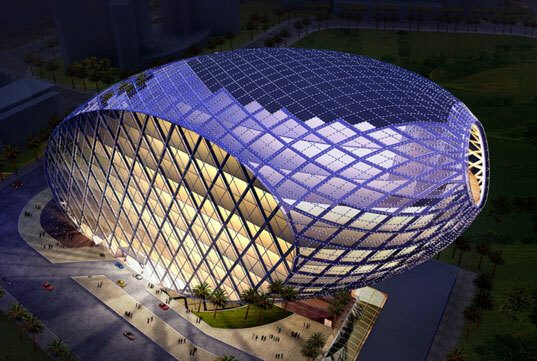 The egg-shaped design has a merit over other conventional buildings as this design covers less surface area on the ground. This jewel is designed by James Law Cybertecture International. The cantilever part of the egg spans over 40m. The construction involved use of new tools and techniques for its execution. It has 3 basements and a concrete core structure framed with steel. It is designed beyond architecture due to the unique idea of creating a span of 40m without any column to support the floor plates. GYS vision, three high rise towers build in Sec. 62, Gurgaon. Designed by Morphogenesis, a top architectural company. It used several permutations and combination for the design of two identical towers. The design doubles up as a public space. The terrace spirals through the tower create visual dynamics. These are built with a vision to provide a variety of spaces in the form of terraces. This extraordinary design is surely a revolution in office towers construction. So, according to me, these creations are a treat to an eye and brilliant use of the mind. With innovations in design and foresight to better-looking infrastructures. Our architects and engineers will surely put India ahead of other countries in the field of modern Architecture. If you think you have knowledge of some other brilliant modern architectural buildings in India then please share in the comments below. And for more such information keep visiting Vision Of An Architect. Hi Admin, Really Good Post! Keep sharing your post on House Design & House Plans, Architecture 3D Elevations. I like your content and will recommend others to read out your blog. Thank you so much for the kind words. Seen your product as well and liked it a lot.